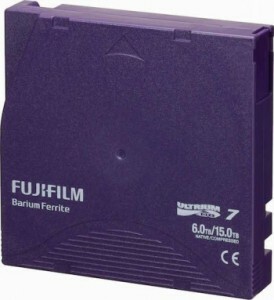 We provide a range of LTO-7 tape from many tape manufacturers. The tape delivers 6TB’s native capacity and 15TB compressed and transfer rate is 300MB/s native and 750MB/s compressed. Ideal for large system backups or suitable for archival purposes. Sony provides peace of mind from the world’s largest manufacturer of LTO tape media. Designed for organisations that need to store massive amounts of information at the lowest cost per GB, the new media provides exceptional error correction compared to previous versions 10^19 vs 10^17 of LTO 6 so an improvement in data reliability. LTO-7 also continues support for Linear Tape File System allows LTO tapes to be seen as a very large USB drive! The drives are also backward read/write compatible with LTO-6 so buying an LTO-7 drive will enable you to use LTO-6 tapes. All LTO media has a lifetime guarantee against defects. If for any reason your LTO-7 tape becomes defective we will send out a replacement. In addition to this if the media fault leads to data loss and it has been kept in the correct environmental conditions and used correctly Sony also offer a tape data recovery service. For organisations that require LTO in their tape libraries we can now provide these with either a new library or upgrade to your existing library, call us for details. If purchasing 20 or more pieces of LTO-7 tapes we can provide you with printed barcodes for use in your LTO tape library that have the correct barcode sequence.